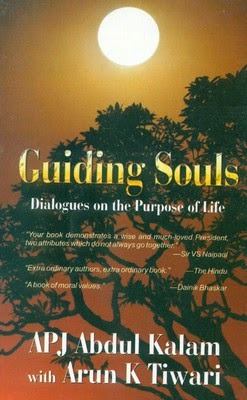 Guiding Souls: Dialogues on the Purpose of Life, by A. P. J. Abdul Kalam with Arun K. Tiwari, delves into the usual but important questions of life. Dr. Avul Pakir Jainulabdeen Abdul Kalam was the eleventh president of India. He is honoured with the highest civilian awards, including the Bharat Ratna. He is unarguably one of the most inspiring personalities of our country, who is fondly referred to as The Missile Man of India. He has authored several best-selling books like Ignited Minds, Wings of Fire, India 2020, Indomitable Spirit, and Target 3 Billion. Dr. Kalam has worked with esteemed institutions across India, contributing to the Defence Research and Development Organisation (DRDO) and the Indian Space Research Organisation (ISRO). Also known for his contributions towards ballistics and launch vehicle technology, he was a main part of the Pokhran-II nuclear tests in 1998. A graduate of Aerospace Engineering at the Madras Institute of Technology, Chennai, Dr. Kalam is currently a visiting professor at Indian Institute of Management Shillong, Indian Institute of Management Ahmedabad and Indian Institute of Management Indore, honorary fellow of Indian Institute of Science, Bangalore, Chancellor of the Indian Institute of Space Science and Technology Thiruvananthapuram, a professor of Aerospace Engineering at Anna University, JSS University, Mysore, and also frequents several universities and colleges across the country contributing his vast engineering and management knowledge base to the youth of India.